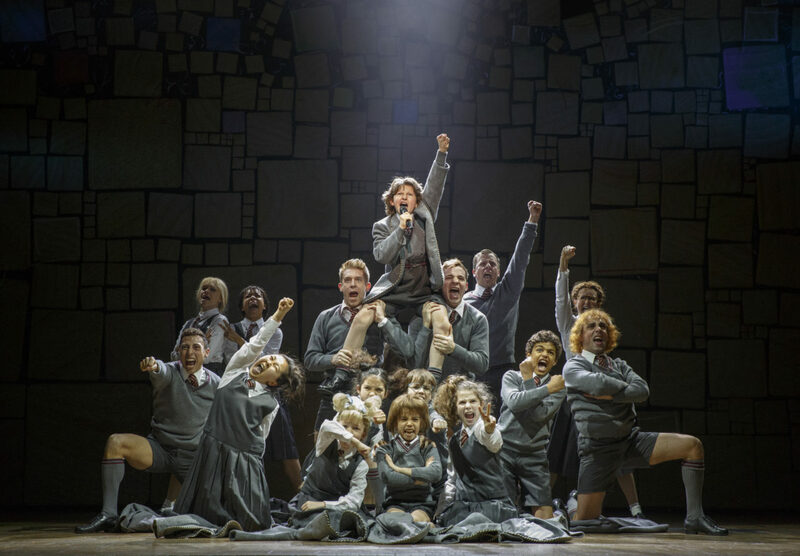 You may be familiar with Matilda through the 1996 film, which starred Mara Wilson as the title character with Rhea Perlman and Danny DeVito as her horrid parents, the Wormwoods. 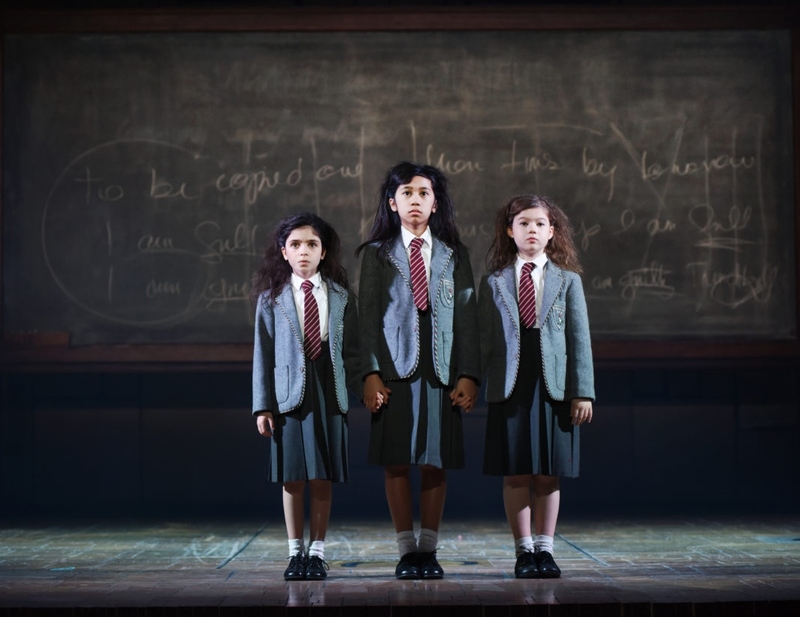 However, Matilda is based on the 1988 Roald Dahl book, and the visuals are influenced by the original illustrations by Quentin Blake, who also created the Crunchem Hall logo that graces the children's blazers on stage. 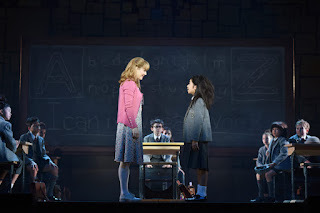 Jennifer Bowles as Miss Honey and Gabby Gutierrez as Matilda. The musical's script is by Dennis Kelly, best known in Great Britain for his television and theater writing, primarily for adult audiences. Though a seemingly odd team to adapt a beloved children's book to the stage, Minchin and Kelly turned out a play that suits the darker side of Dahl, who didn't condescend to children in his writing. Parental neglect, bullying, conspiracy, and murder all coexist in this piece with the love of literature and the joys and fears of childhood, all with catchy tunes and clever wordplay. The production is wonderful, as directed by Matthew Warchus, with ambitious and well-executed choreography by Peter Darling. 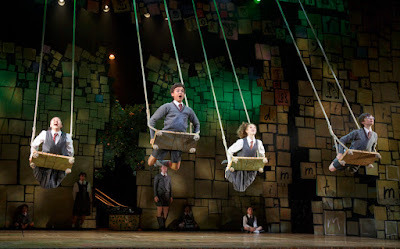 The sets and costumes are designed by Rob Howell, with sound design by Simon Baker, and lighting design by Hugh Vanstone, and illusions designed by Paul Kieve. The production closely resembles the one I saw in London, and all aspects of the production are admirable in creating a fantastic world in which to spend two and a half hours. I know I'm going on and on, but it's really a wonderful show, and I want to give credit where it's due. 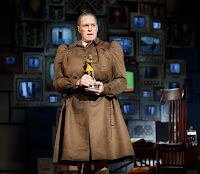 Dan Chameroy as Miss Trunchbull. But on to the story. 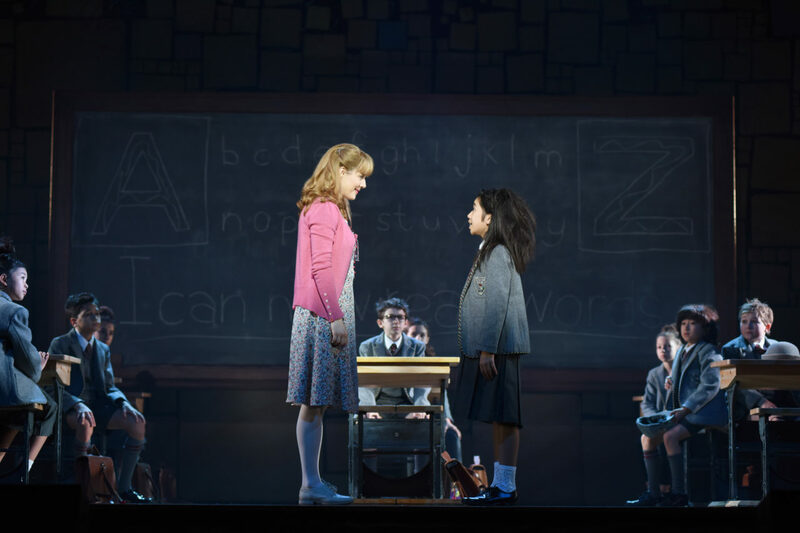 Matilda Wormwood is a remarkable girl. By the time she starts school at age five, she has read Nicholas Nickelby, Oliver Twist, Jane Eyre, Tess of the D'Uurbervilles, and Crime and Punishment, just to name a few. Her extraordinary mind impresses her new teacher, Miss Honey, and annoys the school's headmistress. As drawn by Blake, Miss Trunchbull is a formidable figure, a hammer-throwing champion who refers to the students as maggots and rules by fear. In this production, the character is brought to life by Dan Chameroy, who more than lives up to both the Blake illustrations and the original portrayal of the character by Bertie Carvell. and Jaime MacLean. Photo by Tim Trumble. 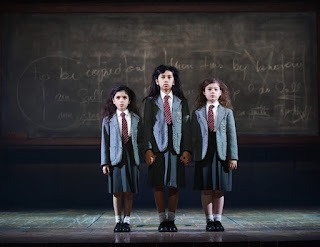 Our heroine is played by three alternating young performers. On Wednesday night, we saw Gabrielle Gutierrez, who was terrific as the unflappable and resourceful, but desperately unloved, Matilda. Her excellent diction and great sound support made the clever lyrics of the songs easy to understand, even as the words tumble out at record speed. I'd read complaints about the quality of the sound in the Broadway production, but the tour seems to have worked through whatever issues they had in New York. Making the show easier to understand, the broad English accents of the original production have been Americanized, with just enough accent left to give credence to the very British language and syntax. Although I'm a huge fan of the original, I think toning down the accents was a good call. Remarkably, I heard very few lyric changes from the original London cast recording, which I've listened to for many, many hours. "Revolting Children" (that's the song, not a judgement). The company of Matilda. Photo by Joan Marcus. An unexpected pleasure of this show was the audience experience. The shows at the Orpheum seem to be particularly plagued by inconsiderate behavior lately, but this audience was wonderful. They were focused and evidently as enthralled by the show as I was. I had a very young man next to me in the first act, sitting on his mom's lap and behaving himself admirably, even when he didn't understand what has happening. And it was wonderful to hear his mother, before the show, explaining to him how he'd have to behave during the play. He didn't make it back for the second act, but I think he had a good time. I don't know if the number of kids in the audience leads to better behavior, but it gives me hope for the future. And the standing ovation during the curtain call was both well-deserved and enthusiastically spontaneous. In short, go see this show! 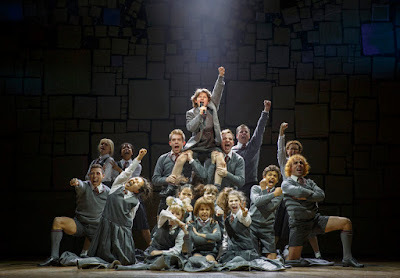 If you love musical theater, children's literature, reading, books, humor, anything British, excellent stagecraft, or talented performers, just go. And then go home and read Matilda. The book is delightful in its own right and you're never too grown up to read Roald Dahl. A little detour down memory lane. At left is the marquee of the Cambridge Theatre, where my sister and I saw the London production of Matilda. Don't take pictures in the theater, kids. Not even before the show. Seriously. And yes, we were scolded by the usher. But in a lovely British accent. And below is the proof that the excitement of seeing the show in London made us lose our fool minds. Even before the show, we were enthralled by the set and its jumble of letters and books, and with finding the words hidden among the decorations. It seemed as though the theater was alive with words. So we took a picture of the set before the show, even though we know better. But isn't it cool?